Ugh. I have such mixed feelings about seeing these pics. I still am not looking forward to Breaking Dawn, but maybe it will be like not being able to keep your eyes off a train wreck. I think Bella has the whole looking sick and getting to thin thing down. Didn't that happen everywhere but her stomach once she was prego and before she started drinking blood? 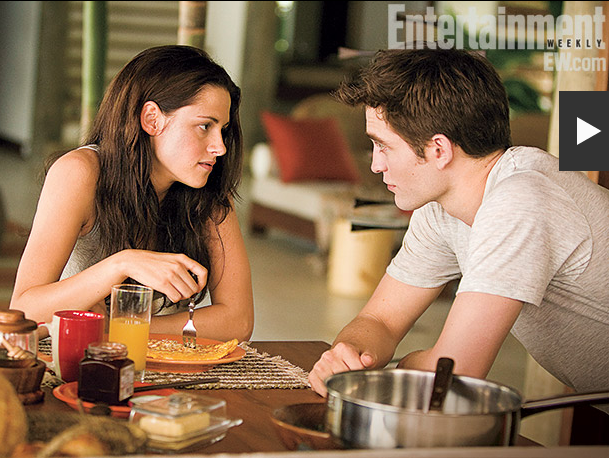 Ok, I'm in the minority here, but I love the pictures and am excited for Breaking Dawn. Kari, thanks for posting :) I shared them with my Twilight girls and they loved them too. Loved the new pics! Although I kinda laughed at how everyone is FREAKING out about "Alice's new do!" if you look at the pic she has it in clips and stuff! So it's not really SHORTER or anything. I agree KStwe is really doing well at looking "sick" she didn't have to try to hard for that one!